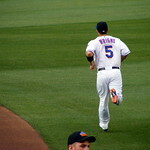 David Allen Wright (born December 20, 1982) is an American professional baseball third baseman who serves as captain for the New York Mets of Major League Baseball (MLB). 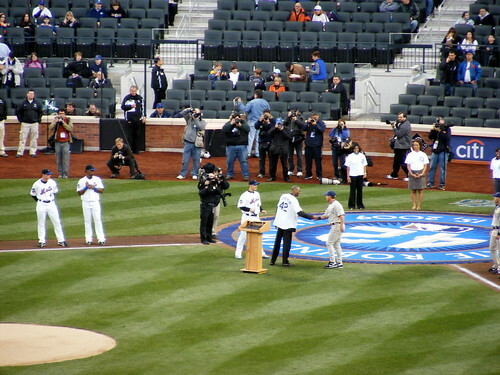 He was drafted by the Mets in 2001 and made his major league debut in 2004. 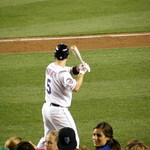 Wright is a seven-time All-Star, two-time Gold Glove Award winner, two-time Silver Slugger Award winner, and a member of the 30–30 club. He holds Mets franchise records for most career runs batted in (RBIs), doubles, total bases, runs scored, walks, sacrifice flies, times on base, extra base hits, strikeouts, and hits. 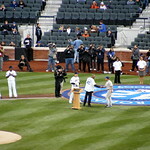 He was named captain of the Mets in 2013, the fourth in team history, and was given the nickname "Captain America," who is also his favorite super hero, after his performance for Team USA, which included a grand slam in the World Baseball Classic.